Nizuni opened its doors at the back end of last year. Owned by the same people as nearby Korean restaurant Koba, it faces stiff competition with its location on Charlotte Street. Not only is this part of Fitzrovia one of the eating hotspots of London, Nizuni also has to contend with Roka and Tsunami, two other well-known Japanese restaurants within walking distance. The restaurant is pretty funky and has ample seating space. Covering three floors, the basement also houses an intimate bar. The food came thick and fast, almost all at once, which was surprising considering our discussion with the waitress about what were going to be our starters and what were going to be our mains. Trying to eat four dishes at once was difficult, especially as our table was small. It also meant that the cooked food went cold quite quickly. Still we enjoyed what we had. 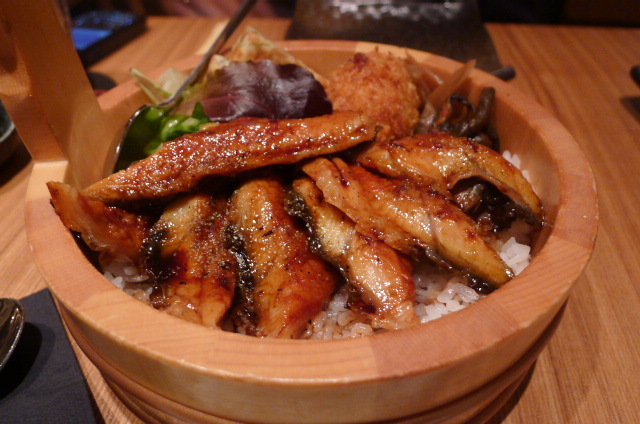 A nasu dengaku (£4.50), aubergine with a miso sauce, was lovely. 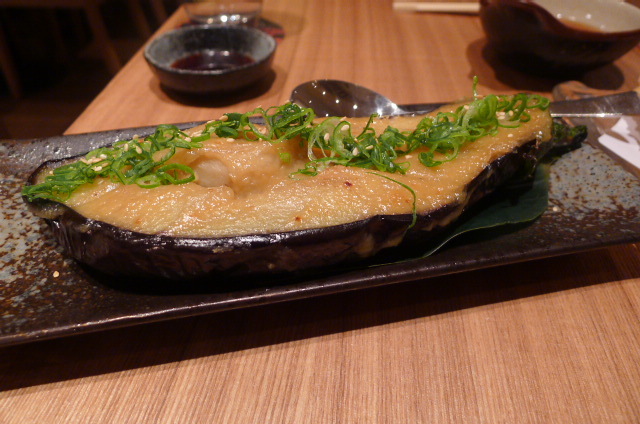 The aubergine was soft and gooey, and the miso sauce was sweet and nicely caramelised. 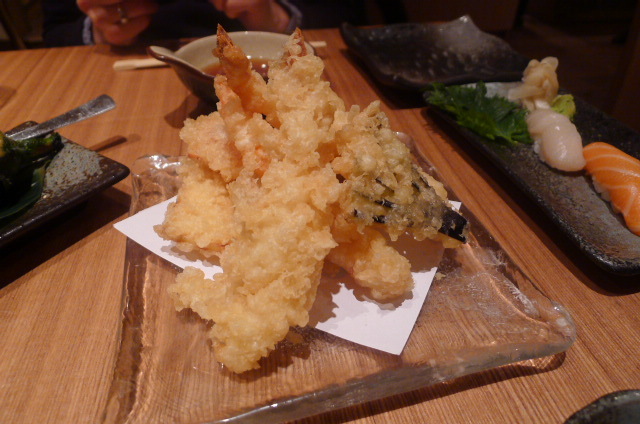 Tempura moriawase (£9.50), a mixed tempura of prawns, fish and veg, came with a super crunchy batter which needed a lighter texture to achieve true authenticity. It was also a little oily. Otherwise this was a decent dish and fairly tasty. 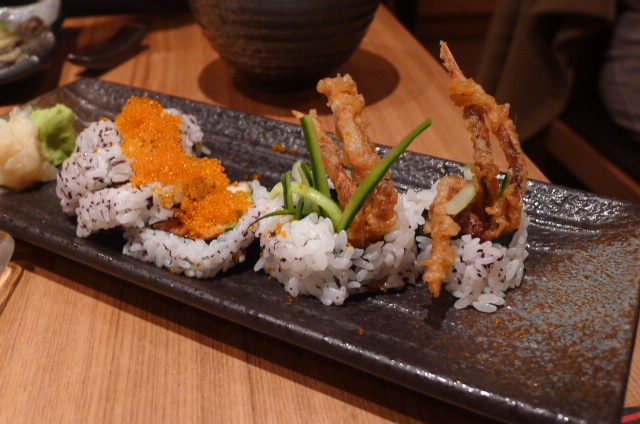 Deep-fried soft shell crab roll with cucumber, avocado and tobiko (£9.50) was over seasoned, its saltiness overwhelming the flavour of the crab. The roll had been sliced so thinly that it was difficult to pick up. 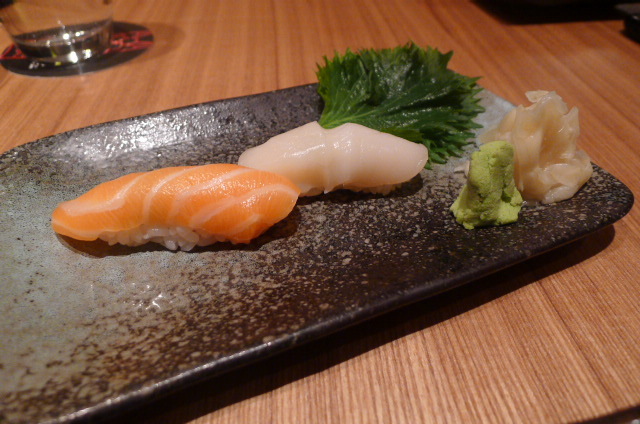 Sushi pieces including salmon (£1.90) and scallop (£2.00) were fresh and tasty. 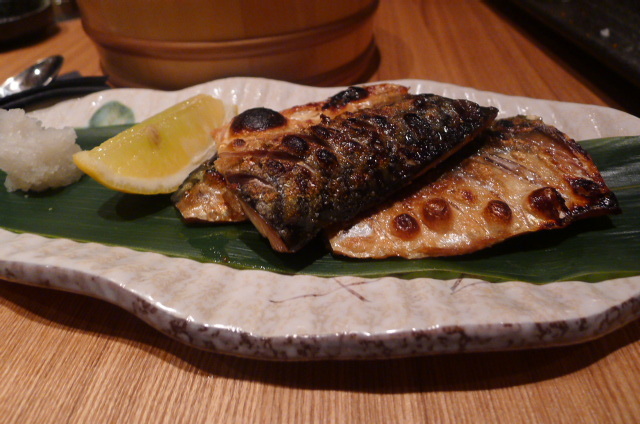 The unaju (£13.50), sweet grilled eel on rice, was tender with a lovely rich sweetness. A well made dish, the portion size was also generous. Interestingly, it was accompanied by a sweetish potato croquette and slices of thick omelette which were tasty, but which didn’t particularly add to the dish. 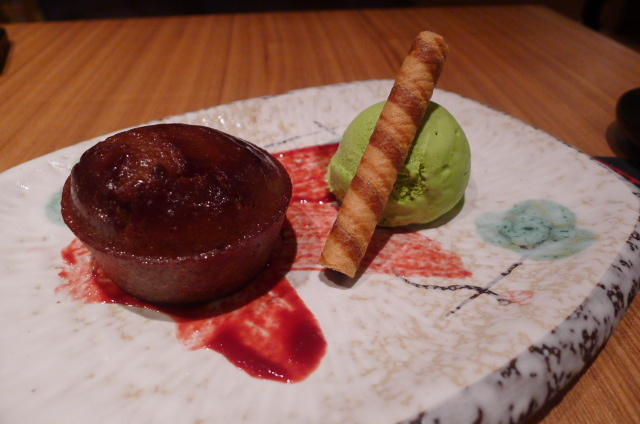 A dessert of chestnut cake with green tea ice cream was extremely yummy. Less of a cake and more of a creamy chestnut mix, the earthy overtones of the tea flavour helped to cut the rich sweetness of the chestnut to produce a well balanced combination. There weren’t any ‘wow’ dishes and I wasn’t entirely convinced by the authenticity of some of the dishes. Still I enjoyed the food overall – some selections more than others – for it delivered decent flavours all round. The service was attentive without being obtrusive, and the prices were fairly reasonable. Competition has meant good things, and I am happy to say that when the bill came, I was pleasantly surprised as it came to an amount less that what I thought it was going to be. Price range: About £30 a head. Excludes drinks and service.